In the meantime I’ll show you some pics of our family room that I took the day before we moved in. I shared this picture of my family room light fixture and several of you asked me where I got it. It’s from Jeremiah Lighting by Craftmade and you can find it on-line here. I was a little worried about the fireplace jutting out from the wall, but I’m going to put some benches or console tables or something along the sides of it to make it work. Fun future decisions! It’s a fun space. We just got the new couch (I’ll share pics of it soon) and that’s it for now! A nice blank slate to play with as soon as I’m done unpacking boxes. Oh I can’t wait to see the rest !! We have been debating on building for about two years now I’m soo picky I really want to build a custom home but the hubs wants to take the easy way and buy a new cuntruction .. So I’m not sure :(.. Any advise ?? I actually love looking at the empty room bc u can see all the lovely details! And I can’t wait to see it at Christmas! You can do it!!! Go Erin go! Love the details in that room. I think you made a wise choice with the fireplace. As far as the TV goes, it looks really good. The way it is set in and the built ins around it really looks great. I know the boxes seem endless but I bet you will have them empty in no time. Love it and love the floors! Although it’s so tempting to just speed through the unpacking process, it’s better to take some time and plan out where you want things and what would make the most sense, especially in the kitchen. I moved things around and rearranged for a good year after we moved in because I hadn’t thought it all through and just wanted the boxes gone! Good luck and enjoy making your house a home!! “How do you eat an elephant? One bite at a time.” It’s so silly, but that keeps me going whenever I’ve got an overwhelming job to do. 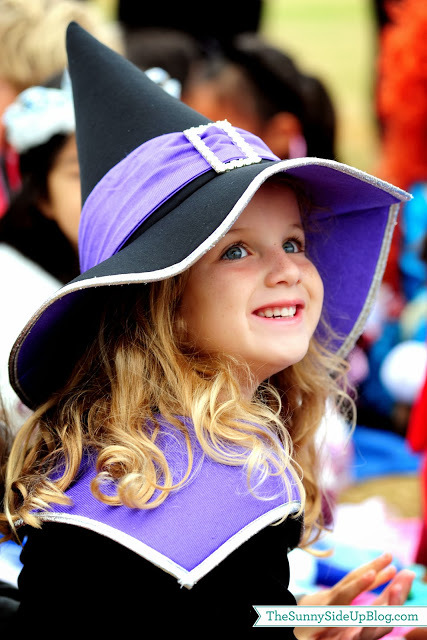 Your family room is stunning, and the photo of your little witch is adorable! I would frame that and put it up every Halloween! Thanks so much for sharing! So pretty! Thank you for sharing with us. These pictures of your empty space are motivating me to clean my own, ha! I love the pictures.Did you manage to get those jeans? 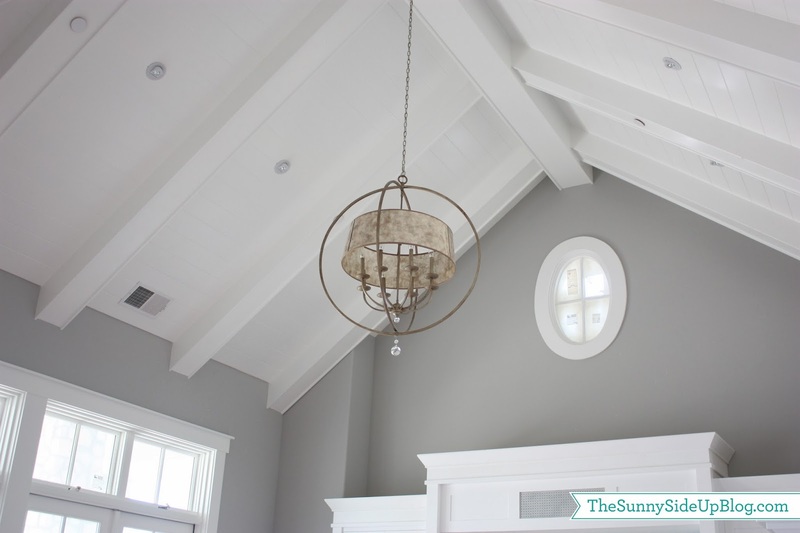 Erin, I really love the light fixture and the contrast that it brings to the room. I think that it helps add some warmth. How are you going to arrange your furniture? 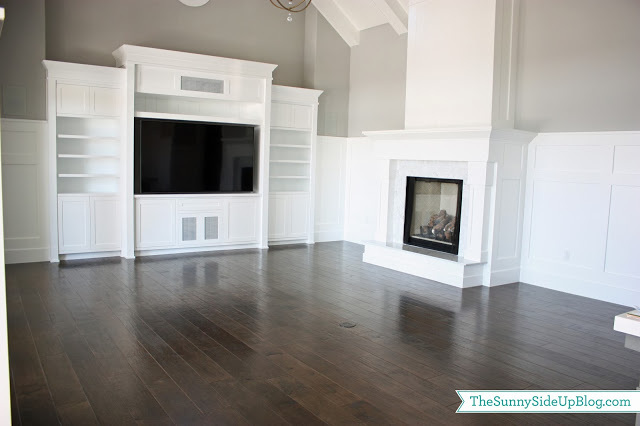 Are you going to make the fireplace the focal point or the T.V.? Or are you going to arrange on the diagonal so that they are equally focal? What an absolutely amazing space! I think you found the perfect combination of cozy and grand. So many congratulations on finally making the move. I’m sure the unpacking will be a distant memory in no time and you’ll be able to move on to all the fun stuff. I see big things for that mantle. It’s so beautiful! You will be making such sweet memories in that room. Really really nice! love the pictures!! Good luck with all the unpacking!!! Jennie – you’re right! I keep rushing just trying to get things in a place, but I know I’m going to be moving things around ten times this way! 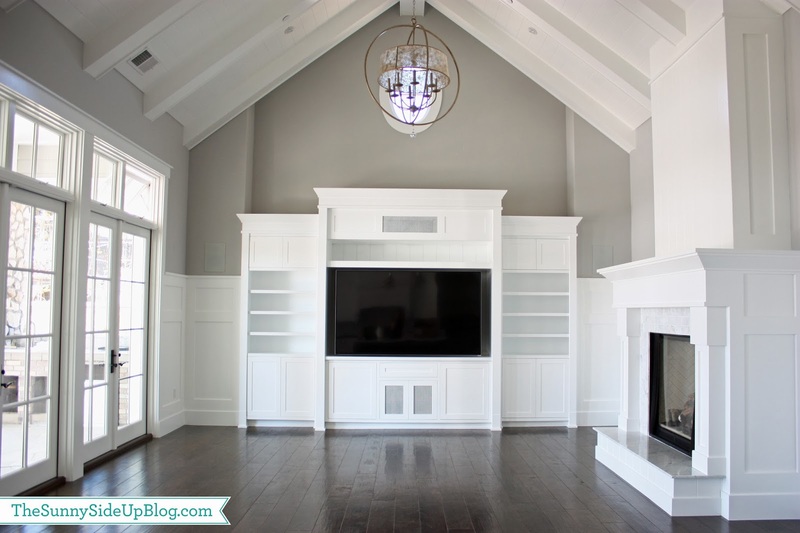 love it… can’t wait to see more and if you don’t mind pls remind us wat the color is again in your fmaily room.. the color pops beautifully against the white trim fireplace and built ins. Congrats on the new home. It is gorgeous. If I’m ever crazy enough to build a home I’m coping 80-90% of your ideas! It’s perfection! And I think unpacking and finding a home for everything is actually WAY more fun and exciting than packing is. Especially when you are working with THIS as your canvas! So happy for you guys. Don’t you love a clean blank slate? There’s so much to look forward to! I don’t like to live amongst boxes, at. all. I would be a rusher for sure… and I like rearranging things, so this wouldn’t bother me. Do what you can without going crazy. :) I LOVE the floors. Love it Erin! I can’t wait to see more. It’ll all get unpacked eventually. Are the kids sleeping ok? Thanks everyone! So fun hearing from you all today! Anonymous – thank you! The color of that room is Seattle by Frazee. Hi Erin! It is so good to hear from you again – and I agree with your statement that “Rome wasn’t built in a day”!! 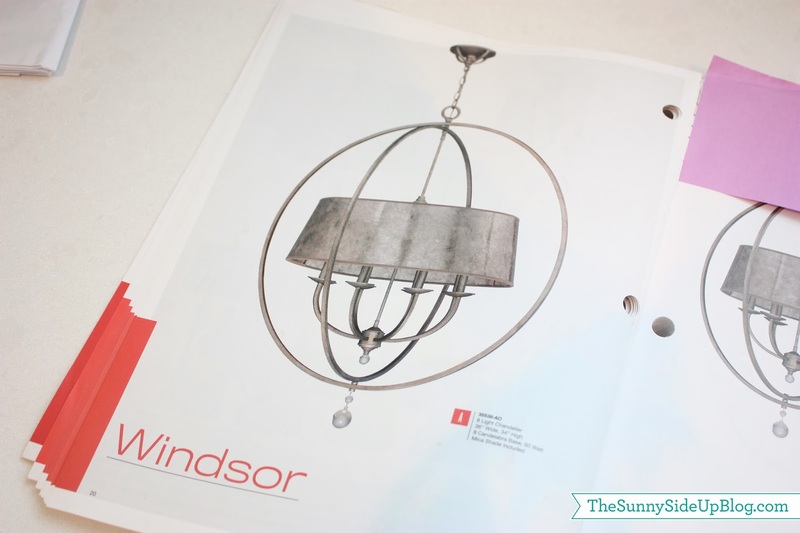 I LOVE LOVE LOVE your orb lighting fixtures – the one in your entranceway and the one in your family room! Your wood floors are just beautiful, and I love the white woodwork with gorgeous gray walls. And I love how your vaulted ceilings are lined with the white woodwork also! I wondered if you had planned a specific spot for your Christmas tree, or if you are going to end up with more than one! :-) Take your time unpacking, and we will all be anxiously awaiting more pictures!! Thank you for letting us have a view of your new home built with love!! gorgeous!!!! you made awesome choices. :-) i wanted to ask you about the floors- can you give me an idea of what you went with? we are in escrow on a house (closing on thursday!!! )- and we have hired a contractor to redo a lot of the house- so I am in the midst of picking out everything. your floors are just what I had in mind! Thank you for sharing some pictures already! It is gorgeous, love it! When we remodeled our kitchen, my husband wanted a big TV on the wall. And, he got it- compromise for sure! It’s so perfect! I love everything about the room, the wood floor, the colors, the molding, the ceiling. Everything has the WOW factor! I can just imagine how excited and happy your family feels to be in your new home now. Thanks for sharing what your new home looks like, so happy for you guys! Amelia says, “Next year when we go to San Diego, can we visit them in their mansion and go swimming?” It’s a date, no? Erin! Love this room, I’m sure your whole house is amazing. Just have to say good decision on the fireplace. We have a corner fireplace and I was so excited about it to begin with, but now I really wish we hadn’t done that. It makes the space really hard to decorate. Didn’t you mention symmetry in your post? Ya, there is no symmetry with a corner fireplace and I am a very symmetrical person, kinda seems like we might a little alike in that way ;) So excited for you, have fun getting settled! I love your new house!! So beautiful! Could you share with me the beautiful color on the walls in your family room? Hillarie – that paint is “Seattle” by Frazee. I think it’s the perfect grey! 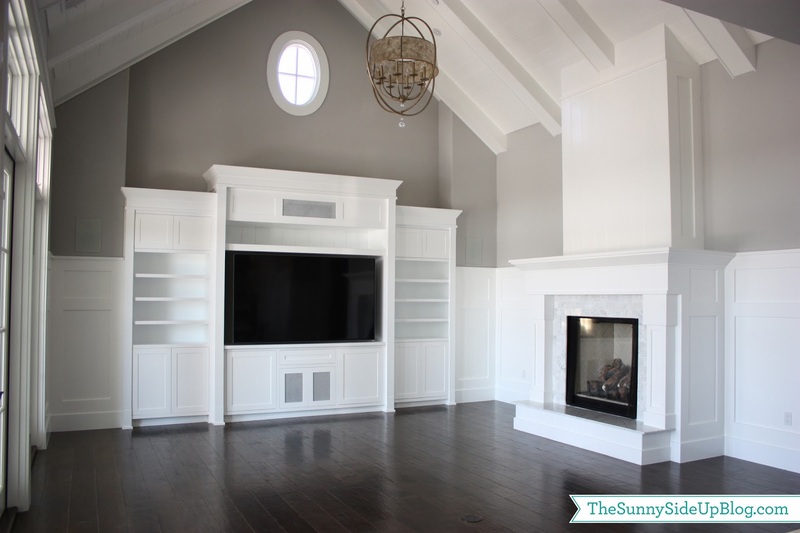 I love everything about your family room! The high but not too high ceilings, built-ins, both in size, color and shape, the paint color on the walls, the fireplace with its great size and location, the gleaming wood floors, the delicate perfectly sized chandelier that ties it all together. This is a room that anyone would love and admire. Great planning on your part for it! Seriously great. I’ve rarely seen a room as good! Oh my word. You are spoiling me with all of these sweet words about my house! Thank you so much! You really are too kind. what paint color is that? and the floors? I love it all!!! we are having a home built in spring/summer. I think that chandelier would be stunning in the entryway! 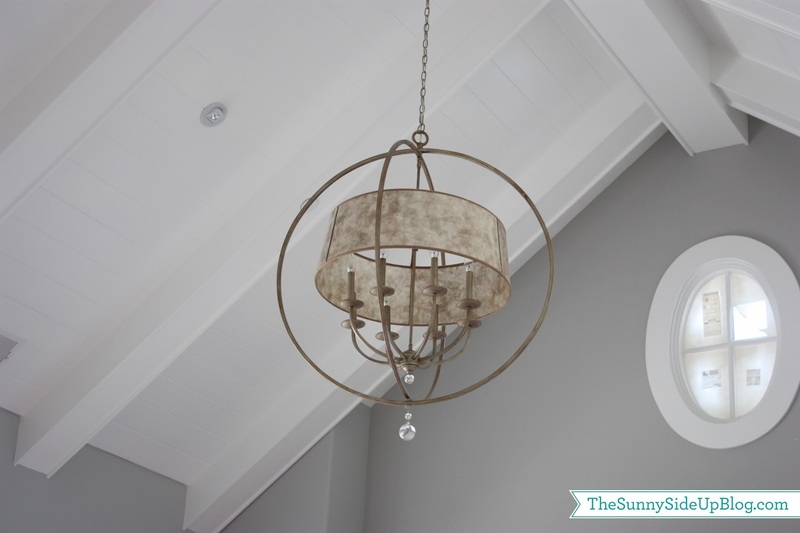 I looked for this light fixture immediately online and looks like they carry it locally for me! Do you think it would make a good entry/foyer light? I would have it hung down enough that it would be viewable from a transom window above the front door. Yes! I think it would be beautiful as an entry/foyer light! I love it. :) So fun! Erin, I love your home it’s gorgeous! We are finishing our basement and are wanting to do a built in entertainment center. I love how you did yours. What Was used to cover up the speaker? Is it metal or like a mesh. I can’t quite tell from the pictures and I’m trying to find a good solution. Thanks!